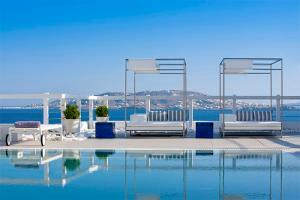 Grace mykonos is situated just above the sandy beach of Agios Stefanos, a 5 minute drive from Mykonos town and 6 km from Mykonos Airport. Landmarks: Mykonos Town, Little Venice, Windmills, Delos Island, Armenistis Lighthouse. Beaches: Kalo Livadi, Paranga, Super Paradise, Psarrou, Elia, Aghios Giannis, Ornos, Platis Gialos, Panormos.